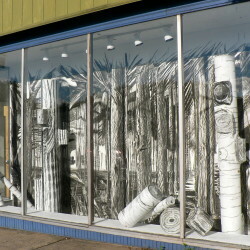 I create site-specific environments made of paper and paper products. 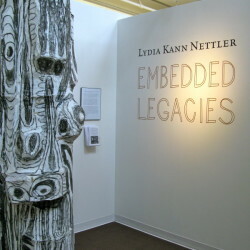 My latest installation at Brandeis University in 2012 was about integrating my family history into the feel of my life in Western Massachusetts. 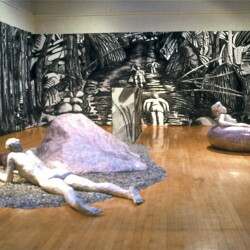 Half the sculptural and drawn installation depicted the reforestation of a labor camp in France after WWII, and the other half showed the natural scenes of the Pioneer Valley. 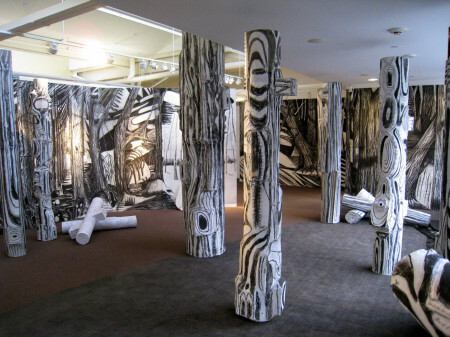 First Graft Installation in 2010 was the first time I integrated prose into my visual art world, creating a story environment. 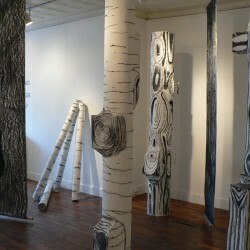 Tree to paper to story is a natural progression, which in this installation comes full circle as the story is grafted back into the tree form. 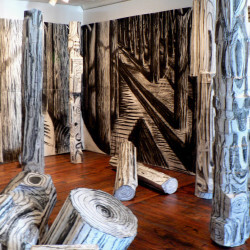 This grafting was the beginning exploration of melding my writing and visual art. The written word works as visual iconography but also suggests an environment of fantasy in the mind. 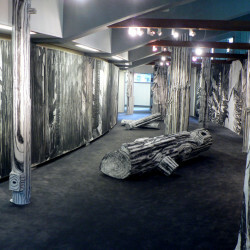 All my installations surround the viewer and create a world of landscape. They range in size from 500 to 2500 square feet. 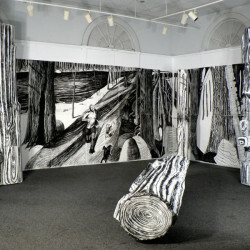 The work is often psychological, whether expressed in the feeling of the woods or a more complex drama with characters. It can offer a contemplative resting place, or the suggestion of mystery. 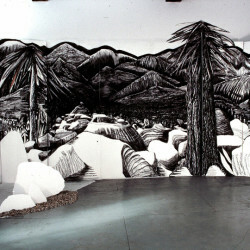 In the installations the drawing style progresses from representational depictions of trees, water, figures, rocks, to more and more abstract symbolic presentations of the same themes. 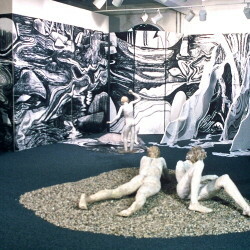 The sculptural trees are made of cardboard and paper maché and either stand alone, or in clusters, or lie fallen on the ground. 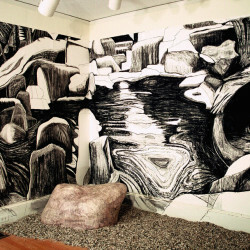 In the installations I move from flat charcoal on paper, to paper maché relief on paper and screen, to three-dimensional representations of trees, rocks, and water. 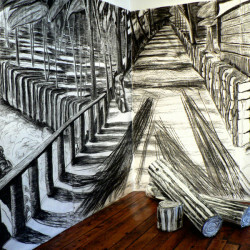 The boundaries of the drawing space can be extended so that the scenes spill over the top or bottom edges of the created walls, even onto the windows.